This entry was posted in Training & education on 2017/02/22 by Susan. They’re travelling different roads — quite literally — to deliver their message about young worker safety. 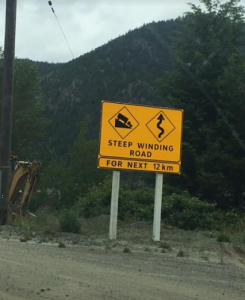 WorkSafeBC’s Young/New Worker and Small Business team, led by manager Glen McIntosh, has been driving on mountain roads and connecting via the Internet to reach people who may not find it easy to attend safety events in person. I wrote about their road trip to Stein Valley Nlakapamux School in Lytton in my post Safety team visits First Nations independent schools. Glen travelled the long and winding roads with WorkSafeBC industry specialist Helen Chandler and Mike Lovett, a public speaker who talks about his serious accident in a sawmill when he was 18. It’s the third year they’ve been taking these journeys and their goal is to visit as many First Nations independent schools as possible. Another way Glen and Helen have been getting their message out is via webinar — on the “information superhighway” — recently discussing safety for young workers in the restaurant, service, and hospitality industry. They were invited to do so by go2HR, an association that serves B.C.’s tourism and hospitality industry by offering programs for workplace safety and other aspects of human resources. The webinar was hosted by Stephanie Mallalieu, go2HR industry health and safety specialist, who also invited Julianne Ratchford, Fairmont Pacific Rim Hotel’s assistant outlet manager. 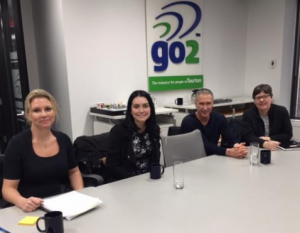 The go2HR webinar attracted participants from across B.C. in a range of businesses, including ski hills, hotels, and industry associations. Stephanie says participants responded (via survey) very positively to the webinar, “particularly to the depth of information provided during the presentation, including the perspective of the young manager working in the industry.” go2HR also hosts a number of webinars on workplace safety and other HR topics for employers. “Since Glen and his colleague Helen work on the new and young worker portfolio at WorkSafeBC, I felt that our participants would really benefit from their expertise and insight,” Stephanie says. Glen also participates in webinars for Small Business BC’s Start Smart Series, where he helps inform new businesses operators about their OHS requirements as employers.